This Pancetta Wrapped in Chicken recipe is a juicy, creamy Italian treat. I adapted this from Loukie Werle’s Italian Country Cooking, turning the wine sauce into a creamy broccoli gravy. Got to get your veggies in too, right? 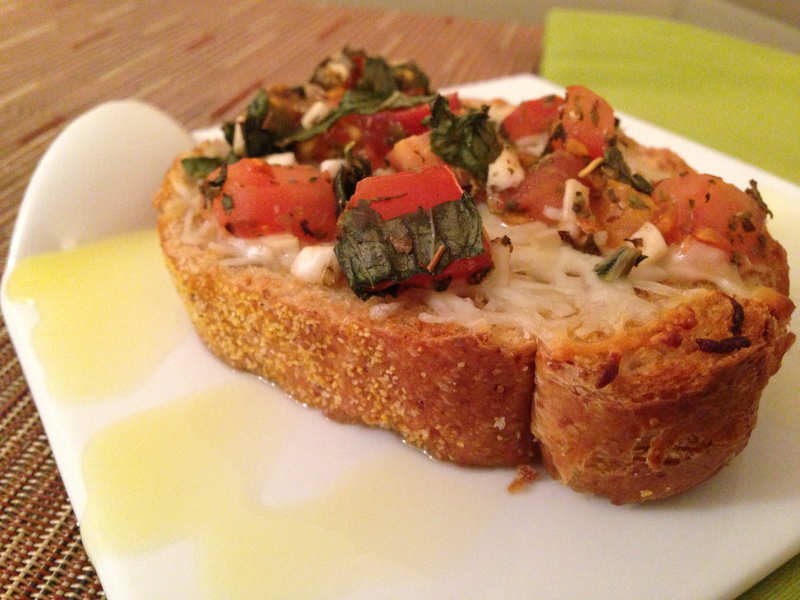 I served this dish with whole wheat bruschetta to top off the Italian theme. Spread out chicken thighs on a flat surface, with the smooth side facing down. Mince the garlic and mix with rosemary. Smother the chicken (but only the side facing up) with this mixture. Roll up the chicken and then wrap a piece of pancetta around it. Tie it with kitchen string, or use floss, first rinsing off any mint flavor. Heat oil in the pan on medium, adding the chicken only when the oil is heated. Brown both sides of the chicken. This should take about ten minutes. Because this is white meat, “brown” will actually look more like a taupe color. Once the chicken is browned on both sides, add the wine and bring to a simmer. Cover and cook at a simmer for about 10 minutes. After ten minutes, add the chopped green onions. Cook for another 10-20 minutes. In the meantime, chop up the broccoli and steam for 10 minutes. Remove the chicken from the pan once it’s done cooking. Add flour to the wine mixture and bring to a boil. Boil for about a minute and then bring it down to a simmer. Add broccoli to the wine mixture. Stir. Leave in for a few minutes, until it forms a creamy mixture. Ladle the creamy broccoli mixture onto a plate. Place 1-2 chickens on top. Dinner is served! Hungry for more great recipes? Explore more on Lawyer in the Kitchen!